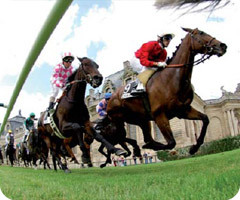 The Quatar Prix de l'Arc de Triomphe is Paris's most prestigious horse racing weekend. With over 6.7 million euros (equivalent to around 10 million dollars) in prize money the finest international horses will be gunning for glory in the 16 thoroughbred races being held over these two days. Part of the prestigious World Series Racing Championship, the Prix de l’Arc de Triomphe attracts around 70,000 people from all over the world and is particularly popular with the British. For such a famous event tickets are incredibly reasonable and so why not dust off your best hat and head off to the races. There will be a free shuttle bus connecting these metro stations with the racecourse from 11:00am to 8:00pm. Opening Hours Racecourse opens at 11am.